COLUMBUS-State Representatives Tim Ginter (R-Salem) and Robert Sprague (R-Findlay) today announced that the Ohio House has passed House Bill 231, legislation they joint sponsored that would enact a pilot program in pharmacies for tamper-resistant containers. House Bill 231 would require the State Board of Pharmacy—contingent upon an appropriation from the General Assembly—to administer a two-year pilot program that would dispense schedule II controlled substances in lockable or tamper-evident containers. Schedule II drugs include narcotics like oxycodone, hydrocodone, fentanyl, and more. The goal of the legislation is to cut down on misuse of prescription drugs by reducing the accessibility of the medications and the threat of theft. The bill would also require the State Board of Pharmacy to reimburse pharmacies for the cost of participating in the program, which includes expenses related to the special packaging for eligible prescriptions. House Bill 231 now awaits consideration by the Senate. 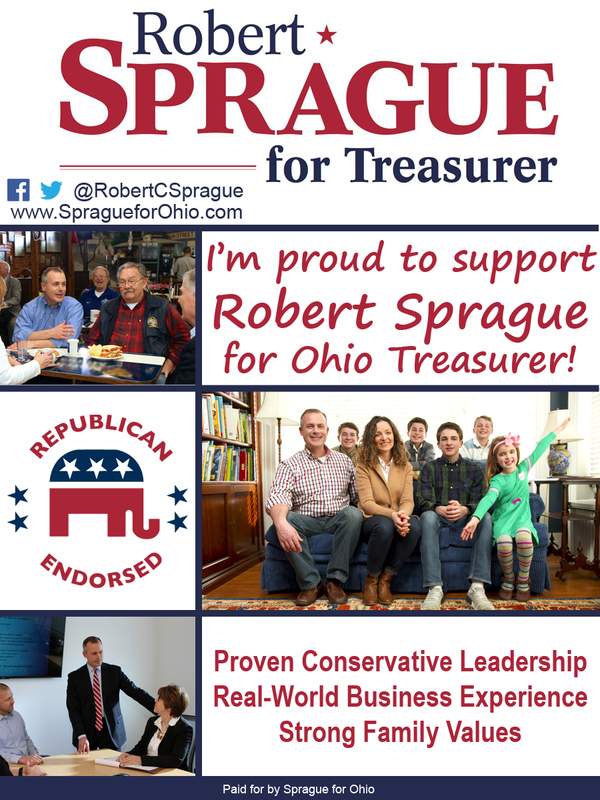 Tell all your friends that you’re Proud to Support Robert Sprague for Treasurer! Click and save the image below and post this “digital yard-sign” to your Facebook, Twitter and Instagram accounts to let everyone know you’re proud to support Robert Sprague. 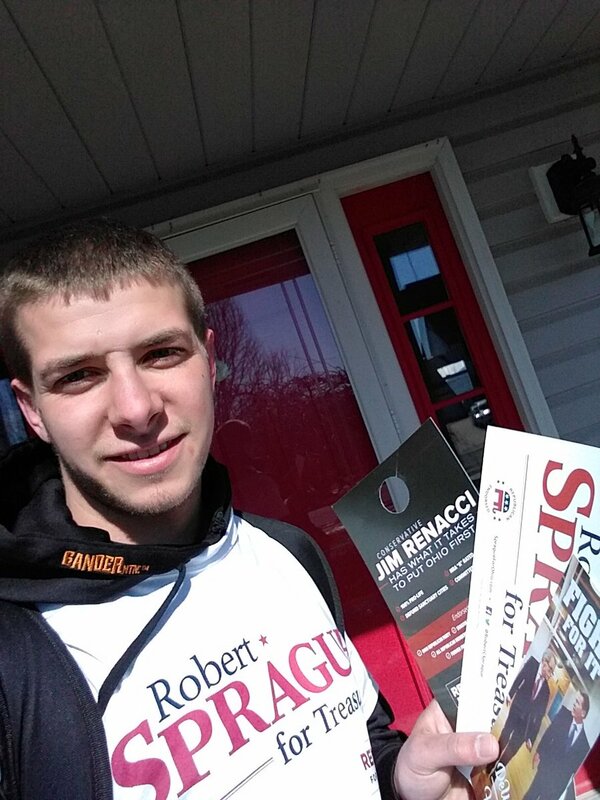 With the Republican Primary quickly approaching, it’s been an exciting couple of weeks for Team Sprague! 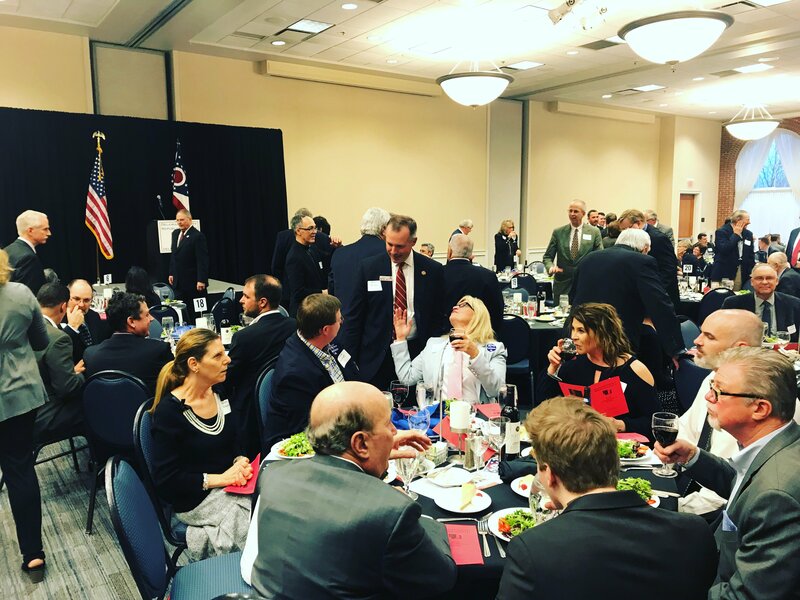 Not only did we release our first TV commercial last Monday, but we’ve been busy on the campaign trail at Lincoln Day dinners and meetings with Republicans across our state. Robert’s earned the endorsements of conservative organizations, Pro-Life advocates and County Republican Parties and his team of supporters continues to grow each and every day. Can you believe that early voting for the May Primary starts Tuesday?! If you’re interested in casting your vote for Robert Sprague for Treasurer before Election Day on May 8th, be sure to check with your local County Board of Elections for your in-person voting options or to request an absentee ballot by mail. We’re in the home stretch and need your help now to make sure that Robert Sprague is our Republican candidate for Treasurer of State! Please keep reading to find out ways you can help make a difference or contact us anytime at Zachary@SpragueForOhio.com and we can get you plugged into grassroots opportunities right in your neighborhood. 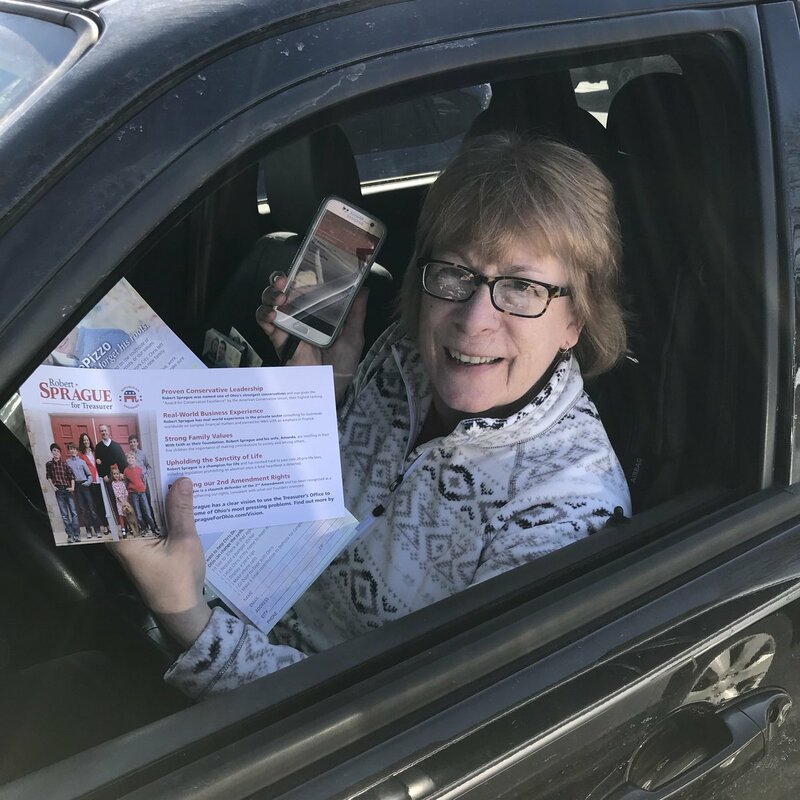 Would you like to join other Republicans in making calls and knocking doors for Robert Sprague? Just let us know and we can connect you with a local phone bank and send you details about upcoming door to door outings. We’re sad that there are only a handful of Lincoln Day Dinners left this season. We think there is no better way to get to know people than over a meal and everyone on Team Sprague has really enjoyed spending our evenings with you. Conservative Republican Robert Sprague has earned the endorsement of Ohio Right to Life PAC in his campaign for Ohio Treasurer. As a member of the Ohio General Assembly, Sprague has been a staunch defender of life and has a proven record of voting for laws that strengthen the rights of the unborn. Now, in his first campaign for statewide office, Sprague is the only Republican candidate for Treasurer to receive the support of Ohio’s foremost pro-life advocacy group. “Robert Sprague has been a trusted friend of the pro-life movement during his time at the Statehouse and played an instrumental role in helping us achieve historic legislative victories for life. We need leaders like Robert Sprague at the state level who will never stop fighting for our most vulnerable Ohioans,” said Mike Gonidakis on behalf of the Ohio Right to Life PAC. Further establishing Robert Sprague as the clear choice for pro-life voters, Cincinnati Right to Life PAC also announced this week their sole endorsement of Sprague for Ohio Treasurer. In addition to Sprague’s distinguished pro-life voting record and unwavering position on matters of life, those who know Sprague best are proud to support his candidacy because they know he is a true champion of the pro-life cause. What a great way to cap off a busy week on the campaign trail. This afternoon, I received the unanimous endorsement of the Ohio Republican Party State Central Committee! I am honored that these trusted leaders of our Party – women and men elected by Republicans to serve as their voice in Columbus – are standing strongly beside me in my campaign to serve as our next Treasurer of State. I am very thankful for the support that we continue to receive from every corner of our state and look forward to delivering on my commitment to bring the type of ethical and innovative leadership to the Office of the Treasurer that Ohioans deserve. The 83rd District State Representative is ready to be Ohio’s chief financial officer. Robert Sprague talking to the Allen County Republicans Friday afternoon about his run for Ohio Treasurer. Sprague served as auditor and treasurer for the City of Findlay before he was voted to take over the 83rd House District Seat. Sprague pushed forward a lot of legislation to help Ohio battle the growing opiate problem. Even though the treasurer’s office deals with the state money, Sprague says he has a plan, if elected, that would help fight the opioid problem. “Something I can do in the treasurer’s office is bring forward an innovative financing model to bring private money, new fresh ideas from the private sector to bear on the heroin issue. So we can provide that financing mechanism in the treasurer’s office, to put our shoulder to the wheel in every single office, try and address this epidemic in the State of the Ohio,” said Robert Sprague, Republican candidate for Ohio Treasurer. Sprague does not have a challenger in the May Primary, but he will face either Neil Patel or Rob Richardson on the Democratic side of the ticket in the November Election. Watch the news report here!